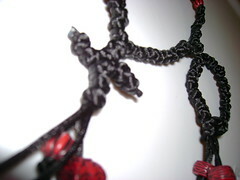 I finally was able to figure out how to make the cross at the end of the prayer rope. I made one with 100 knots, and two bracelets. Now… to use them. 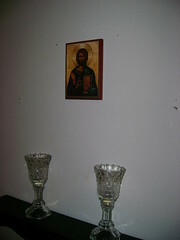 This is my icon corner, and my chrismation candle. 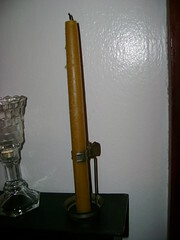 The candle is too big for taper candle holders, so I found a couple antique ones on ebay that can hold various sizes. It’s pretty darn cool. I just have to congratulate you on the prayer rope! 😉 I’ve tried it before, and can’t manage it for the life of me! 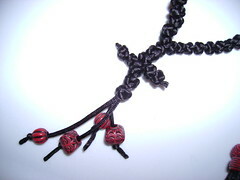 Whenever we meet in person, you should show me how to do the prayer rope tying. It came out great!